How much do Facebook Cover Images Matter for Facebook Pages? With the transition of Facebook Pages from destinations to becoming publishers in the News Feed, how much does the Facebook Cover Image still matter? When Facebook first rolled out Timeline to Facebook Pages, the goal was to provide a way to scan through a history of key posts and milestones. The Cover Image was a huge change from the limited vertical Profile Picture space and was positioned as a way to set off the whole Timeline experience. Having a Cover Image that brought a brand to life was critical and many companies made creative images that were featured in articles across the web as showcases. Timeline sadly also signaled the beginning of the end for users visiting Pages. More and more, users simply engaged with brand posts in their feed, and brands saw the number of user posts on their Pages beginning to dwindle. Eventually, the majority of consumption and engagement happened in the News Feed. So, if engagement happens in the News Feed, is there any point to creating Cover Images? The answer is yes! Facebook Pages are still viewed many times each day, mostly as result of either a search on Facebook or someone clicking a Facebook button on a website somewhere that links to the Page. There are also those who will click from a News Feed post to the Facebook Page it was published from, but those are the minority, in my experience. That means that the Cover Image is STILL a great way to showcase a brand. 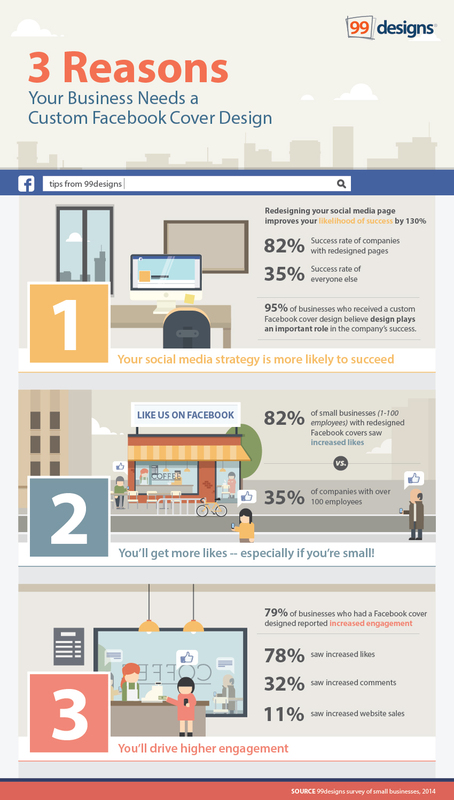 It is the big first impression a user gets when they view a Facebook Page. And, it is a golden opportunity to drive additional engagement with that user while they are on that Page. The last one is the most interesting to me, because it reinforces that Cover Images are a great tool to encourage engagement. Below, I will walk through some ways to accomplish that. The first way to increase engagement is to put in a direct call-to-action. ProClip has an offer that asks users to pre-order and directs them to an application tab. This could also announce a sale or a new product and display a URL. Sadly, clicking on the Cover Image won't go to that URL, but it can also be put in the description, where it WILL be clickable. If a Facebook Page has published a post to discuss a topic, it is easy to direct additional viewers to it from the Cover Image. The Cover Image can also ask questions that users can answer by posting to the Page. In this example, AVG Technologies asked users to answer a poll as part of their participation of the Child Internet Safety Summit. Displaying the pictures, names or quotes of Fans who have engaged with a Facebook Page as part of the Cover Image can really get those featured excited. And once they see themselves in the resulting News Feed post, they will be sure to like and share, increasing the exposure to all of their Facebook friends. Each week, Dunkin Donuts recognizes a Fan with a picture in their Cover Image. A New Way To Engage? Cover Images are still a great way to introduce a brand to Facebook users and they also provide another avenue for engagement. Have you seen any Cover Images that are really engaging? Stay tuned - in my next post, I will talk about working with Cover Images in a mobile-first world.